Montana may not get as much attention as some other states when it comes to gold mining, but that does not mean there isn’t gold here. In fact there has been millions of dollars in gold found here. One of the biggest gold nuggets ever found in Montana was found just south of Butte, and is on display to the public so anyone can go see it. Most folks know Butte is a copper town, but there is also some good gold to be found in this area too. This spectacular discovery was pulled from a creek in the Highland Mountains back in 1989. Quite a find, considering that miners have been searching in this area since the 1800s! Over 100 years after the old-timers first started digging for gold in the area, one of Montana’s largest gold nuggets was found. Although there has been plenty of gold found in Montana, this state isn’t all that well-known for producing large gold nuggets. So it must have been a real surprise when this 27-ounce beauty was unearthed! 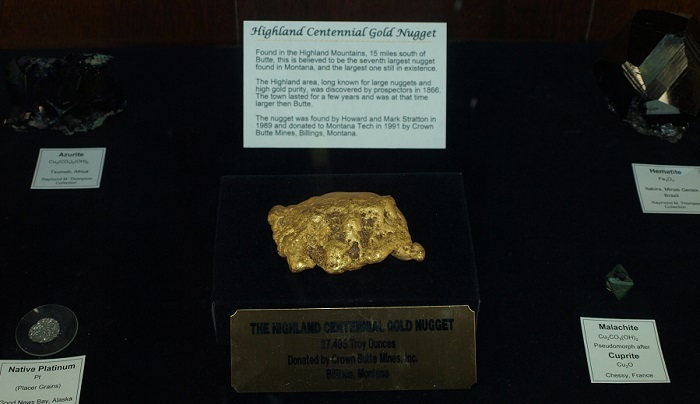 This discovery, which came to be known as the “Highland Centennial Nugget,” is documented as the 7th largest nugget found in Montana. Unfortunately most of the larger nuggets were melted long ago. Back during the early days, most miners were only interested in gold for the amount of cash that it would sell for. Placer gold was melted and assayed, and big nuggets were lost forever. Not the case with the Highland Centennial Nugget. This huge gold nugget is on display to the general public. Anyone can go see it and enjoy this amazing treasure from Montana. It is on display at the Mineral Museum at Montana Tech in Butte along with a wide variety of minerals from Montana, the Northwest, and around the World. It is quite an impressive display that is well worth a visit. 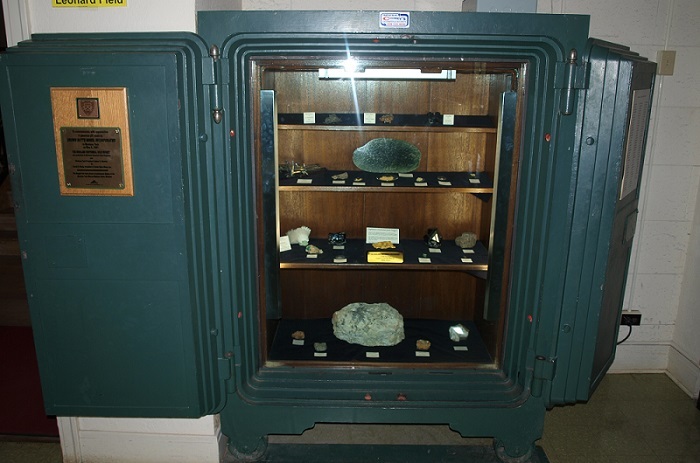 The safe that houses a 27-ounce gold nugget and several other rare minerals from Montana.